Much of the active career of this Hobart-born sculptor was spent in London, where he lived and taught from the late 1940s until his death in 1977. Inspired by the work of Henry Moore, Richmond was a full-time assistant to him in 1949-50, continuing to count the revered English sculptor a mentor and friend. The carving techniques of his compatriots Ola Cohn and Lyndon Dadswell were of early significance to Richmond, their monumental effects giving way in his work to more attenuated forms. 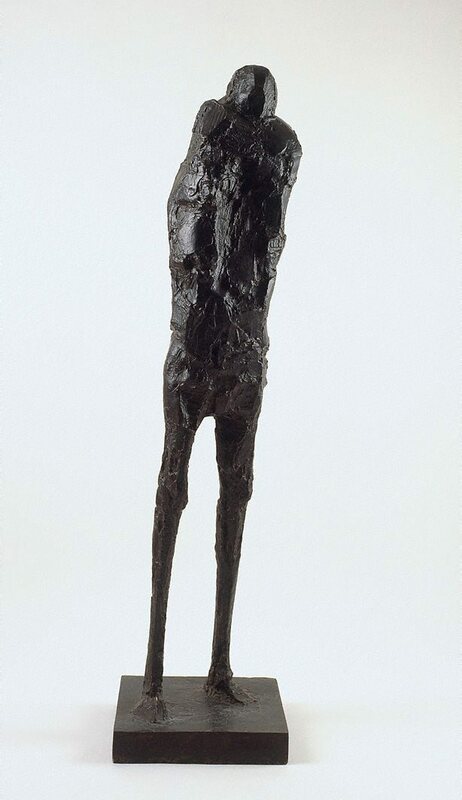 Richmond produced a sequence of standing figures in bronze, a material that suited his increasing interest in the scarification and corrosion of sculptural surface as a metaphor for inner states. Sentinel epitomises these stark, aggrieved, yet rigidly armoured personages. Though the reductionism of Giacometti is operative, Richmond's own excavatory strategies and emotional defensiveness dominate. Signed inside base, incised "OR ...". Deborah Edwards, Australian art: in the Art Gallery of New South Wales , 'Mosaic and figure', pg. 213-214, Sydney, 2000, 223 (colour illus. ), 302. Bruce James, Art Gallery of New South Wales handbook , 'Australian Collection: Painting and Sculpture', pg. 102-181, Sydney, 1999, 164 (colour illus.). AGNSW Collections , 'From Colonialism to late Modernism', pg. 7-106, Sydney, 1994, 74 (colour illus.). Australian sculptors , 'Oliffe Richmond', pg. 560-63, Melbourne, 1980, 561 (illus.). Editor Unknown (Editor), Bulletin , Sydney, 17 Jun 1967, page unknown. Editor Unknown (Editor), Sun-Herald , Sydney, 11 Jun 1967, page unknown. Editor Unknown (Editor), The Canberra times , Ainslie, 08 Jun 1967, page unknown.